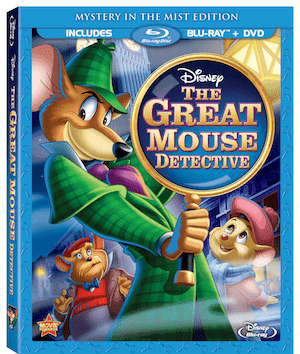 On October 9th, Disney fans can own The Great Mouse Detective on Bluray/DVD. I am fairly certain my parents rented this film for me when I was a child, but I remembered nothing about it other than that it was about mice and was a detective mystery. I was very excited to watch it again, because it would feel as if I were seeing it for the first time. The Great Mouse Detective is the 26th animated feature length film from Disney Studios, and is based on a series of books written by Eve Titus (sadly, these books are now out of print) about a mouse detective named Basil. I have never read the books and didn’t know they had inspired this Disney film, so I can’t say how closely the film follows the books. After her father is kidnapped, Olive Flaversham (Susanne Pollatschek) seeks out the famous sleuth Basil of Baker Street (Barrie Ingham) to help her find her father. The kindly Dr. Watson (Val Bettin) becomes caught up in the case and acts as a partner to Basil when he helps Olive find Basil’s home on Baker Street. The unlikely trio collects clues that the kidnapper has left behind and learn that Basil’s nemesis, Professor Ratigan (Vincent Price) has taken Olive’s father and is plotting against the Queen. Basil must rely on both Olive and Dr. Watson’s help to foil his greatest enemy once and for all. Both my daughter and I enjoyed The Great Mouse Detective; I was thrilled that she was captivated by each and every scene, especially since several friends had told me this movie frightened them when they were children. It is a bit darker of a story than most Disney films, and the colors used in the animation are dark hues as well. As a parent, I found nothing objectionable in the story and am comfortable letting my 4-year-old watch this. This is easily a film that both parents and children can enjoy; there are a few scenes that are more “adult” (Ratigan feeds a mouse to his gigantic cat, though this happens off screen) in nature, but parents could use some of the scenarios as teaching tools for younger children. So You Think You Can Sleuth? This feature provides a history of how private detectives came to be, and some information on the very first detectives. We also get to see which characteristics Basil shares with Sherlock Holmes. Viewers can also watch a fictional crime and see how it is solved using Basil’s techniques. The World’s Greatest Criminal Mind Sing-Along Song This feature is the scene where Ratigan sings his villain song, “The World’s Greatest Criminal Mind”. Viewers see just this scene, and the words are printed on the screen so that they can sing along. The Making of the Great Mouse Detective This feature offers the viewer a behind-the-scenes look at how this film was made. There is commentary from voice actors Barrie Ingham (Basil), Val Bettin (Dr. Dawson), Vincent Price (Ratigan), and many more. Viewers also learn about some of the new technology that was used by the animators to make this film. I don’t remember watching this as a child either, but it sounds exciting. I bet our whole family would enjoy it now…we have an aspiring detective in the house, so it will feed that interest. Thanks for the review! Sounds like a good story that the kids would enjoy. Thanks for sharing. This movie is one of my favorites of all time! I hope santa brings it to our house this year! The Great Mouse Detective looks really entertaining and my 2-yr old would love it. Great review you did on this one. Congrats on such good work. my kids would love to watch this. It is very entertaining.